All times subject to change, check at the park or check this space for updates, or sign up for our twitter feed. Attendees can ask for advice on techniques, tricks, new moves. Please come prepared with a set of questions, or a specific trick or move that you would like to develop. Kim is a college student, living in Mammoth during the winter, and San Diego during the summers. In addition to shredding lakes and cable parks around the world, Kim is an accomplished multi-sport athlete. She is among the top snowboarders who call Mammoth home, she rips at the skatepark, and if she is near the ocean, she will drop in a set, as long as the waves are big. One of Kim's most amazing feats was beating 16 male athletes to become the Push Games Overall Champion - the Hexathalon of Action Sports. 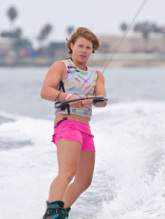 Kim learned the sport at the world famous Carlsbad Lagoon, where wakeboarding was invented, and has interned at Liquid Force, working for the world leader in the business. Kim hopes to make a career in the action sports business, and hopes to turn PRO on the wakeboard tour in the next year or two. This summer, you will find Kim teaching a full week GIRLS CAMP, alongside her California buddy Melissa Marquardt. From June 6-10, KCW will be home to a focus of female shred energy, led by these two excellent young women. 2009 & 2010 Burton Amateur Tour, @ Bear Mt. 10:00 AM - 11:00 AM - Exclusive Cable Time for Pros, Registered Contestants, Season Pass Holders & "Foolies". All Riders must fill out an online registration, and download and sign a waiver form, you can review them below. "Don't Have a PayPal Account?" link which is 2 lines below their yellow "log in" box. "Is you is, or is you aint, a Foolie?" This is our "FUN" Category. You are allowed to enter one category, PLUS ride for free in the Kneeboard category, if you want to compete for fun in kneeboards.